Teeko Graphics, Inc. is a local, family owned and oriented business in Lake City, Florida, established in 1999, by Rob Summerall in his very own garage! When Rob first started the company he saw that Lake City had a need, and decided to make it his mission to fill that need! 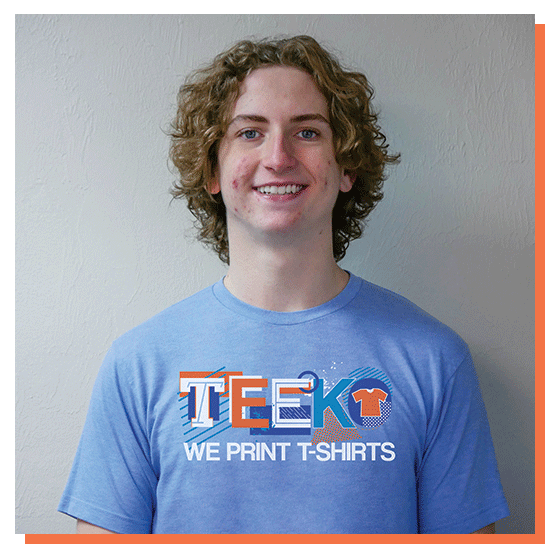 Teeko is known for our quality screen printing and phenomenal customer service as well as being an active contributor to our local community. We have since moved up from a garage to our own 7,974 square foot building after being located in an old convenience store for 18 years! In almost 20 years Teeko has grown substantially and is always working to keep up with trends and the latest and greatest opportunities that we can extend to our customers. With experience and an infinite strive to bring quality work, Teeko has remained true to our goal from the original business plans to be fast, friendly, and professional in every circumstance. When the company first started, there were just three employees, which is where the value of unity began to grow within the company. With a team and leadership dedicated to unity, Teeko has a family oriented and comfortable environment for all customers and employees alike. Unity is something that we are always keeping in mind, when it comes to helping out the community, our employees, and generally bringing people together in the best way we know how, with t-shirts! Teeko also donates to multiple entities every year, with the owners, Rob and Mary, being in several community-oriented groups as well as employees volunteering for several events around our town as well. This is how we come in contact with several of our customers, by getting to know them first! Teeko is also very active in online sales with contracts including retailers such as Zulily, Groopdealz, and Shopify. Our business has gone from $50,000 in sales the first year to now being over a million dollar company! We have our community to thank and all of our wonderful customers! 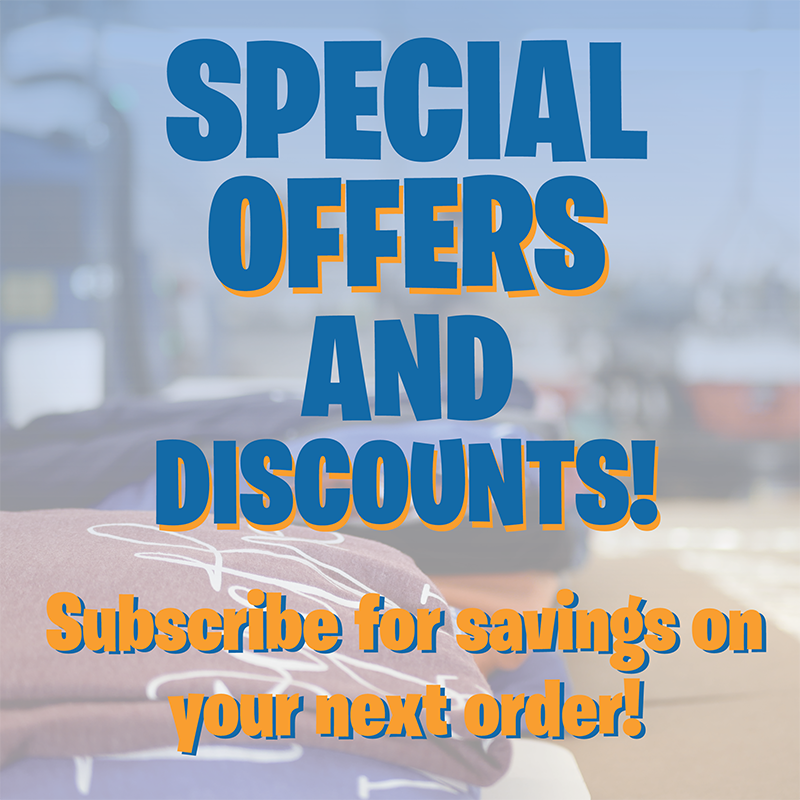 Please check out our website for more information for your very own order and for helpful information, examples, or submit your information for a customized quote today! 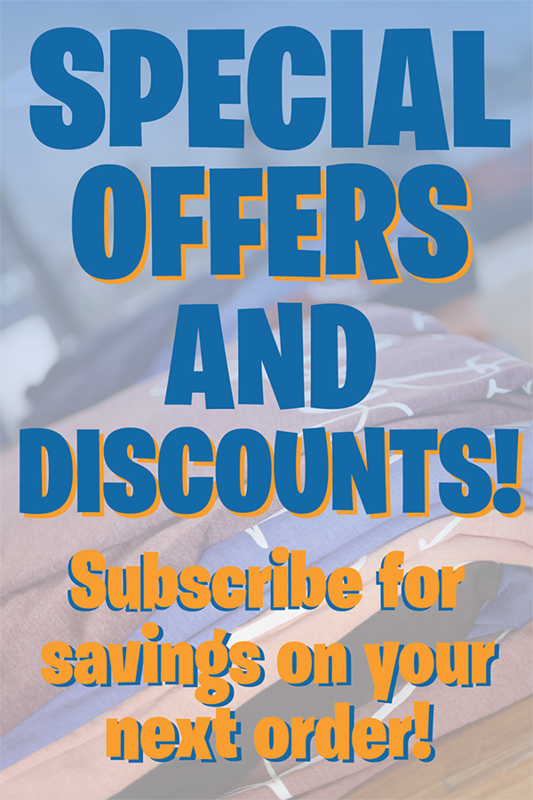 At Teeko, we are committed to taking the hassle out of designing and ordering your custom t-shirts. We strive every day to provide fast, friendly, professional service to each and every customer. Ready to get started? Visit our Request a Quote, or fill out the form below. We look forward to working with you! 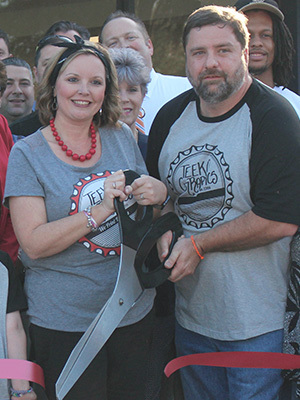 Rob, CEO of Teeko Graphics, Inc. has been a visionary and team builder since beginning the business in 1999. Rob’s hobbies include small business, of course! He loves helping others to succeed! His favorite movie is Forrest Gump and sound effects and strange voices are his secret talent. 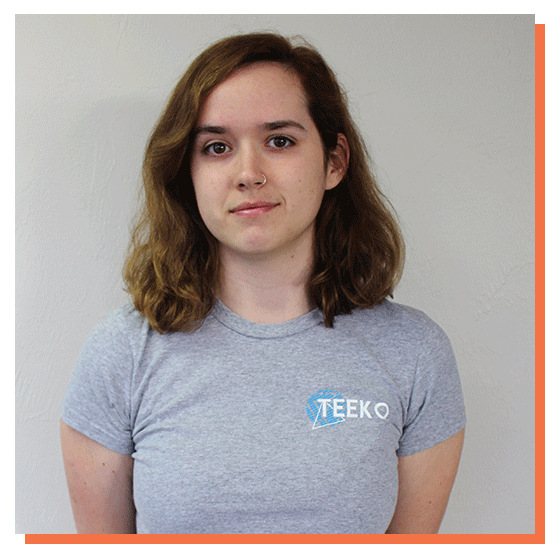 As President of Teeko Graphics, Inc. Mary has become an expert in putting out fires. From 2002 to 2011 she worked on and off at Teeko until 2011, when she left the corporate world to work for herself, where she could affect change. Mary’s favorite movie is Dirty Dancing or Hope Floats. The most important thing to her is family. Vice president, Chyanne is known for being knowledgeable and a problem solver since she started in June of 2013. Her hobbies include painting and she stands at 4’10” tall. 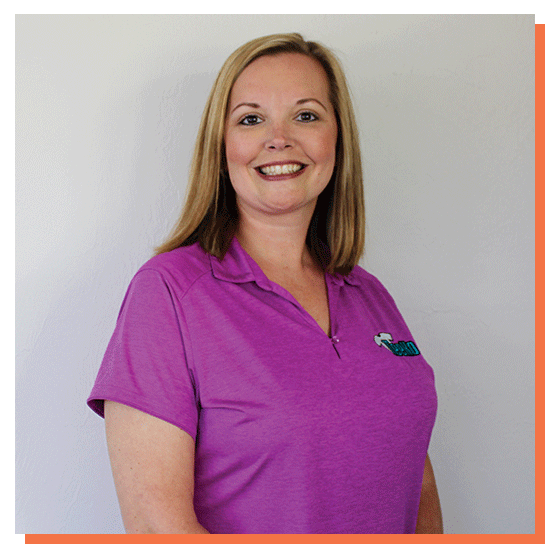 Her favorite work memory is the day that Teeko closed on the new building and Rob and Mary took all of the team members to dinner in a limo. 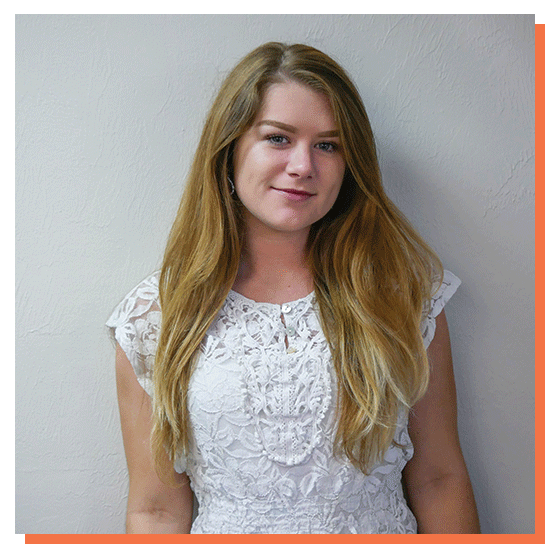 Marketing Director , Kyli, has been typing and clicking at the speed of light since she started working at Teeko on April 11, 2016. Kyli directs and handles all of our videography, photography, and social media! Check out her hard work on any of our platforms! Her favorite color is orange. She enjoys spending time at Disney World and can be spotted wearing Converse shoes any day of the week. Mo is our Production Team Leader, he has mastered the skill of being a screen wizard since he began working at Teeko on May 9, 2016. He brings organization and efficiency to all things in production! In his spare time, Mo enjoys being a DJ. His favorite color is black and his favorite movie is The Texas Chainsaw Massacre. 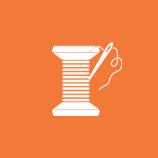 Melissa, Embroiderer, has had a dedication in staying organized since March 2017 when she started at Teeko. 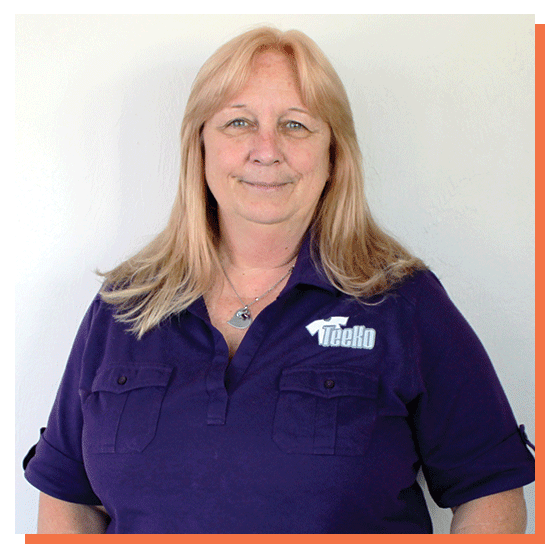 Her knowledge and organization keeps our embroidery department running smoothly! Melissa enjoys creating digital drawings for friends and family. She can speak some french and her favorite movie is Back to the Future. 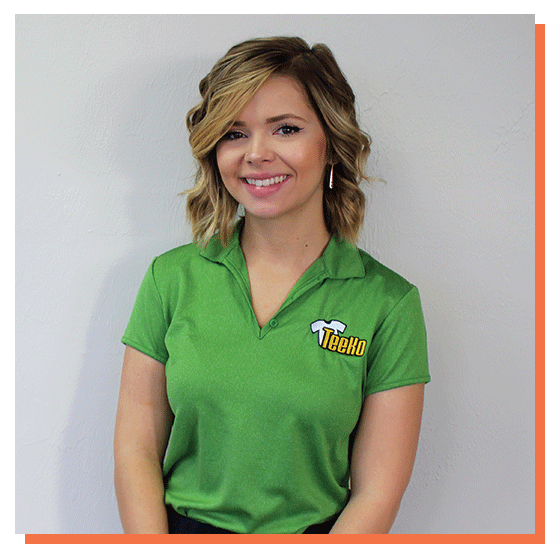 Lead Sales Representative, Katie, takes pride in keeping everything organized since becoming a part of Team Teeko on March 20, 2017. Katie loves going on trips with her loved ones and spending time outdoors. Her guilty pleasure is eating cookie dough. In her spare time she likes to read and play the piano. 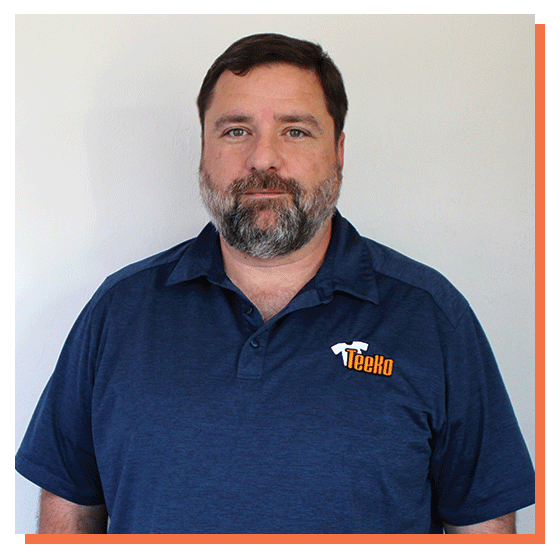 Joey joined the team on June 6, 2017 and has become and experienced printer in the time he has been with Teeko, making production faster! Joey’s favorite color is baby blue. He enjoys dancing and he loves being a dad to his wonderful children! Sandy is the assistant to the owners, and she has been keeping Mary organized since she started on July 6, 2017.Her favorite color is yellow. In her spare time, Sandy loves kayaking and camping! Sandy’s favorite movie is The Notebook. 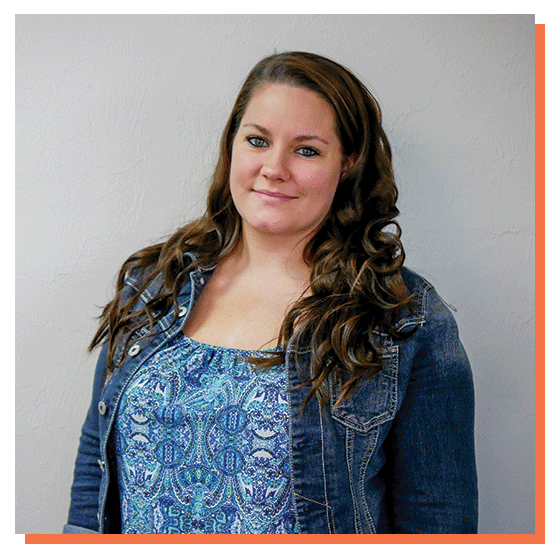 Kasey started working at Teeko on January 15, 2018 as a Customer Sales Representative. Since then she has started working in the shipping and receiving department which makes her versatile and a fast learner. Kasey loves to swim and loves sushi. Her favorite show is How It’s Made. 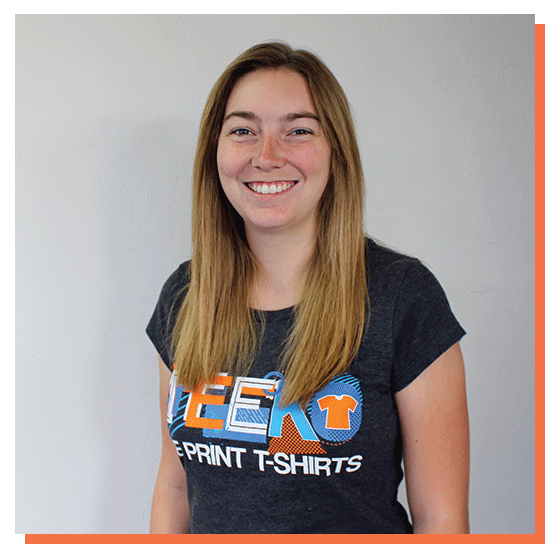 Graphic Artist, Hailey, has been a fast learner since joining Team Teeko on March 5, 2018. Hailey’s ability to learn quickly and work efficiently has helped to keep the graphic design department on track at all times! Her favorite movie is The Princess Bride. Hailey’s favorite song is Midnight Crusade by Dance Gavin Dance. She enjoys photography as a hobby. 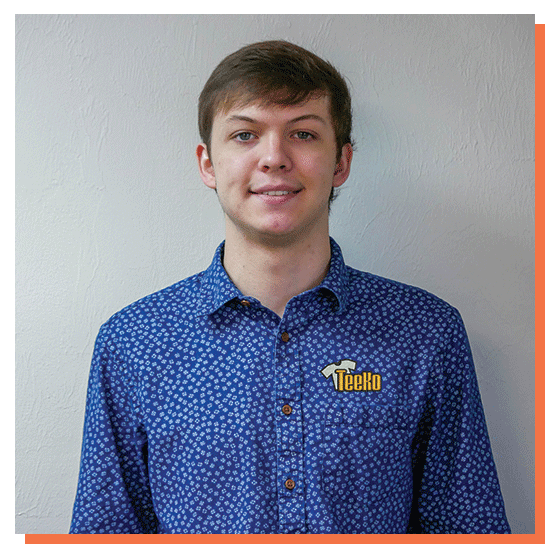 As a graphic artist at Teeko, Brannon has been able to learn quickly and become a great help in the art department since August 28, 2018! 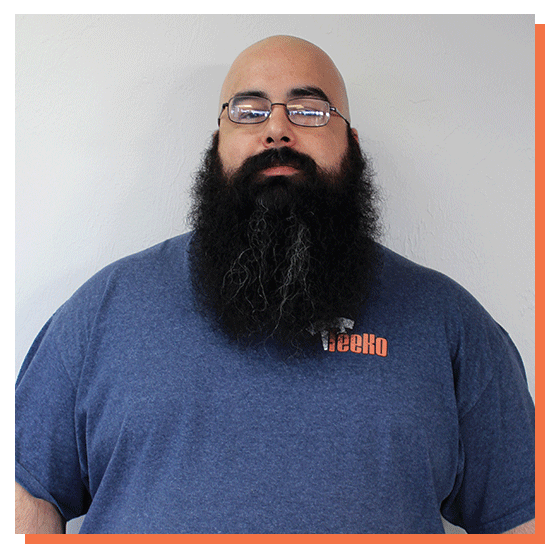 In addition to designing awesome t-shirts Brannon enjoys playing and listening to music and his favorite movie is Interstellar! Also, hand him any kind of Rubix cube and you will discover his hidden talent! Jacob started at Teeko in October 2018 helping in production! 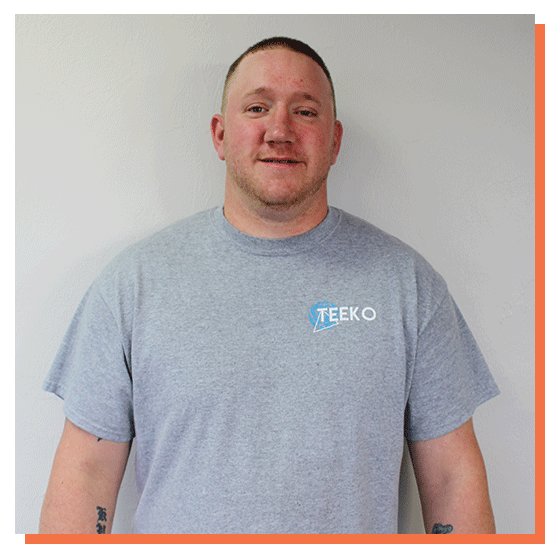 He is a printer here at Teeko and his number one skill so far has been excelling in his position while being a dependable employee! His favorite color is blue and his guilty pleasure is Netflix, where he likes to watch his favorite movie, Aladdin! 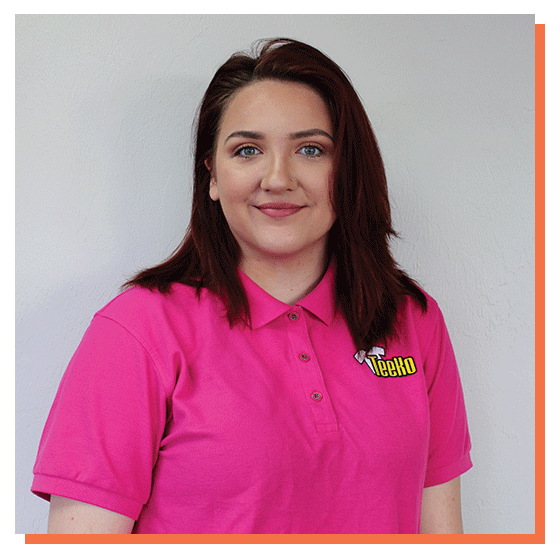 On October 8, 2018 Bobbie started at Teeko as a Sales Representative. 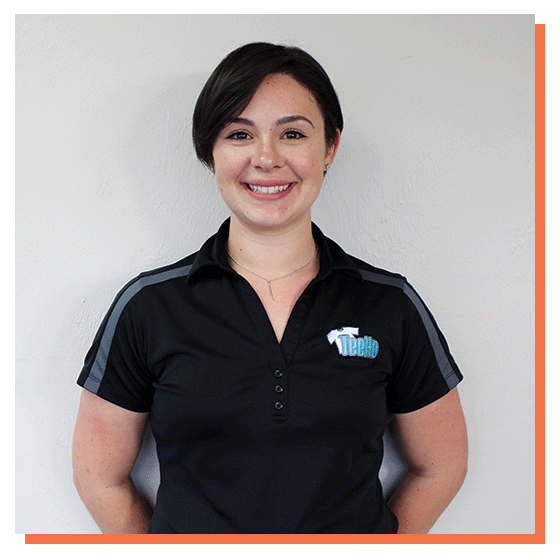 She has been a wonderful addition to the team and her customer service skills are exceptional! When she’s not taking shirt orders she enjoys being a mom, camping and outdoor activities. She also sings and cooks while on Pinterest all at the same time! 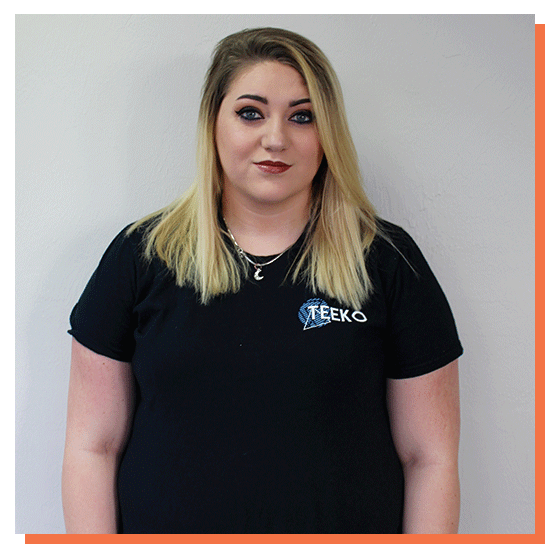 Darian started at Teeko on October 10, 2018 and has been exceptionally helpful in production every since. 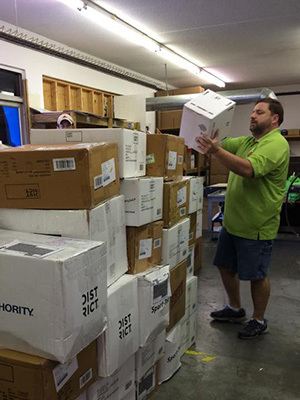 Darian has been folding, bagging, tagging, and making sure your shirts are packaged and sent out with special care. Darian enjoys scuba diving in her free time and her favorite color is teal!